Nowadays hotel revenue management has become a somewhat controversial buzzword in hotel industry, back in the day, revenue management meant opening and closing availability and rates. When Online Travel Agents entered the scene, the industry became obsessed with simple adjustments of rates. Today, the playing field is drastically more complex. Modern revenue managers are experts at analyzing, forecasting, and optimizing hotel inventory through availability restrictions and dynamic rates and have, appropriately enough, become instrumental in managing a hotel’s demand. With the evolve of RM keep this fact in mind. Only 12,000-15,000 hotels in the world today use a major (RMS) tool. The rest of the 500,000+ hotels out there are using either something their chains developed or their own custom ized Excel spreadsheet as their RMS tool. Hotels that are not using a RMS tool now will begin adopting solutions over the next five years at a much faster rate than they have over the past ten years. And RMS tools developed by the chains will have to embrace innovation in the same way RMS providers will, and this is not until even more recently have hotels begun to implement formal revenue management policies, programs and systems. Fueled by technology, the field is now a true science. Increasingly powerful computer systems can handle many tasks essential for revenue management. The growth and proliferation of the Internet has changed core communications for travelers and hotels alike. Whereas early on in the era of hotel bookings reservations were either made directly (telephoning the property/face to face) or via a travel agent, over the past few decades a larger offer of booking channels has emerged, The OTA segment is becoming a strong competitor to the individual booking sector and distribution channels; it has already taken substantial share from traditional contracted booking channels, mainly wholesalers and tour Operators. Amid these developments, the online travel agency (OTA) has arisen, changing the rules of revenue management – and the professionals who practice it – on an almost-continuous basis. The role of OTAs and online distribution in revenue maximization has gained unprecedented importance. Of lately, hotels have started implementing formal revenue management guidelines, roping in committed professionals to sharpen and focus their revenue generation processes and augmenting their profitability. Hotels are using advanced travel technology tools for handling their hotel revenue management. When we talk about OTA’s They refer to Online Travel Agencies and some of the most popular ones are Expedia, Priceline, Orbitz, Booking.com, Hotels.com and OneTravel, among many others. The main goal of these organizations is to sell hoteliers the idea that OTAs are a great showcase for their businesses and, therefore, an aid to increase sells–in other words, it generates more exposure of your brand and products than the one you could create on your own. The trick? High commissions and a series of other medium and long-term side effects that you would possibly want to avoid in your business. OTAs have emerged as one of the most prominently online distribution channels among different sales channels for revenue generation, although hotels have to shell out chunks of their money to OTAs in the form of commissions. Approximately 60% of travelers comparison-shop rooms before booking, which makes OTAs a popular place to do business. In fact, the hotel industry has realized that OTAs and hotels exist in a symbiotic relationship, nurturing and supporting each other for mutual growth. Factors like OTAs have a much bigger advertising budget, access to more traveler data and more success in drawing in online traffic are the main reasons hotels are choosing OTAs as online distribution partners. Of course, OTAs have a different attitude. i.e. Expedia, Inc.’s stance is that hotels can benefit from the $3.4 billion it spends on marketing each year, OTAs can entice a different kind of customer than a hotel can. To that end, Expedia gives client hotels access to revenue-management tools through Expedia Partner Central, The OTA spent almost $830 million last year on technology alone, moving toward this launch. Now, hotels have total control over their listing, including the ability to load photos and text, see competitors’ rates and spot forecasted demand in a particular city. In today’s highly fragmented marketplace, competition is intense and hoteliers are constantly on the lookout for better ways to optimize their revenue. With OTA dominance continuing to grow, revenue management offers properties the opportunity to take control of their profitability. Maximizing your hotel’s revenue isn’t a matter of simply focusing on selling out all room in your property – those days are long gone! In today’s highly competitive marketplace, strategizing to maximize occupancy over revenue could actually be detrimental to your bottom-line. Indeed, hotels that undercut their prices to sell out could actually be earning less than similar properties that employ revenue management strategies. The list can be extend to reach to much more, however fulfilling the job of revenue manager has never been easy. As technology advances, more OTAs come on the market, and the sales distribution channel picture becomes increasingly more complex, this fact will not change. Revenue management will need to be at once more rigorous and more flexible, working in parallel with the changing nature of OTAs. 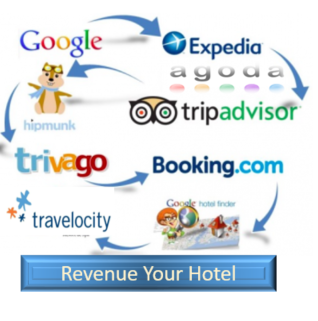 This mean that OTAs is occupy a critical spot in the revenue management mix. It does mean that their role is changing in some key ways, and that the future will likely bring changes the industry cannot yet imagine.